Graduation is just around the corner. I will be a college graduate in just a months time. College was fun, stressful, but fun. It is almost time to move on to the next chapter. Here is a little tidbit of what I want to get done post-grad. 1. Graduate// You can not be a post-grad unless you graduate. At this point passing and graduating is the main goal. My junior year my adviser asked me what I wanted out of my college experience, research, internships, organizations? I was in such a rush all I said was to graduate. Hopefully, this does not follow into post-grad. 2. Save// Being a human is so expensive. I found that out in college. I want to be more aware of my spending habits, start saving for the future, and become fully financially independent. 3. Read more// College was busy. Even if I had downtime I would feel guilty reading for pleasure and not doing homework assignments. Also, my biggest impulse buy is books, so I want to get through everything I have bought throughout the years. 4. Learn// Again, I felt guilty if I was dedicating any free time to hobbies. Plus, so much time for class was dedicated to just one topic. Those semester long research papers were killer. I want to spend more time learning things that I can use later on in my career. I understand basic Photoshop, but I want to go even more in depth. I also want to get into coding a little more, that is a foreign language to me, and I want a basic understanding. 5. Travel// This is the first time in my life I have had the down time to go on a big trip. I have a couple of months off between jobs. Once I figure out the logistics, I will be traveling through Europe! 6. 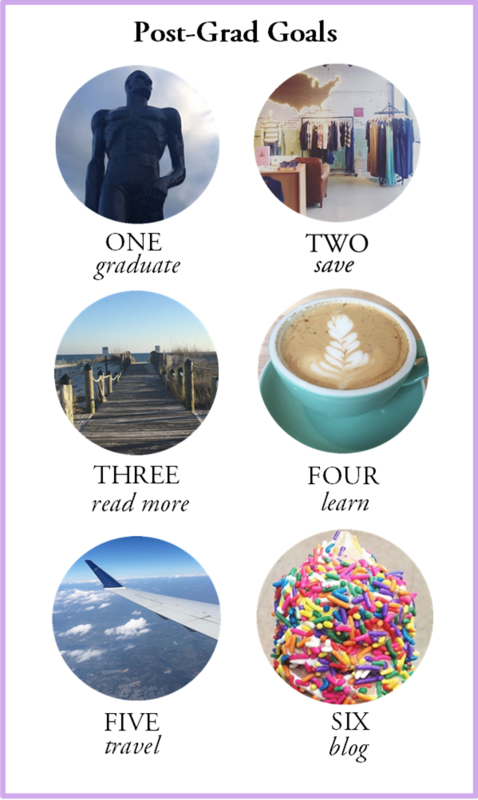 Blog// I want to become a better writer for sure, but post-grad I want to focus on the blogging. I always forget how much I enjoy it when I go on a break. I am redoing my blog soon (finally), I am excited for that!